A revolution is occurring in Kenya. Or perhaps 'transformation' better fits. What's happening is an explosion in the number (and fast-growing maturity) of community-based wildlife 'conservancies' in Kenya, which, although famous for its wildlife 'parks' and tourist businesses, has been losing its wildlife at alarming rates in recent decades. Community conservancies are different than national parks and other forms of wildlife conservation because they include local people. From a handful of conservancies started in Kenya just a few years ago, some 200 of them have now sprung up across the country. You may have missed this good news, what with Al Shabab causing havoc in parts of this East African country and elephants and rhinos still being illegally slaughtered for their tusks and horns. But over 10 million acres of this country have been formally set aside in just the last few years for community-based conservation benefiting people and wildlife alike. Among the more unexpected items being conserved along with the wildlife here is peace. In the heart of Kenya's vast northern rangelands, for example, Samburu families banded together in 2004 to create the West Gate Community Conservancy to protect wildlife and redirect tourism profits to local livestock herding families. It's working. Local families have partnered with a tourist company with which they share tourist profits. Gone are the days of the profits of Kenya's wildlife tourism flowing largely to the rich in Africa, Europe, Asia or North America. Among the additional benefits the conservancy is providing are communal funds for education, health care, jobs and training. And the conservancy is managing to protect the wildlife that is generating this local economic good. Poachers kill fewer elephants inside the conservancy than in nearby unprotected savanna. Even elephants mortally injured elsewhere by poachers, says the manager of Kalama, a nearby conservancy, will retreat to the safety of these conservancies to die. What's brand new is that the local communities here in Kenya's conflict-prone north are beginning to see their conservancies deliver something even more fundamental to them: better security, fewer conflicts and more secure land rights. 'Communities that have been caught in a seemingly endless cycle of retaliatory cattle raiding and that formed conservancies are breaking this cycle by returning stolen livestock to their owners', explained Jeff Worden, a senior scientist with the Northern Rangeland Trust (NRT). This organization supports 26 conservancies across Kenya's 'wild north' with planning, security measures, and monitoring. (AET), a consortium of partners who work to balance development and wildlife conservation in southern Kenya, has stopped road construction and hotel development where these are hampering elephant migrations. Benson Leyian, general manager of the Amboseli Ecosystem Trust, told us its goal is to have 'livelihoods connected to natural resources' in a way that is compatible with wildlife. Other communities, seeing their best, most productive land 'grabbed' by the powerful, have created conservancies to strengthen their rights to land. Those communities that still live among abundant wildlife can attract high-end lodges, with companies paying herding families for access to their land (increasingly via monthly electronic bank transfers). Elerai Conservancy, a partner of AET near the Tanzanian border, is an example. Eight individual land owners re-aggregated their land into one larger landholding to benefit from wildlife. The profits of a small lodge in the conservancy are today divided between wildlife conservation and the eight families. 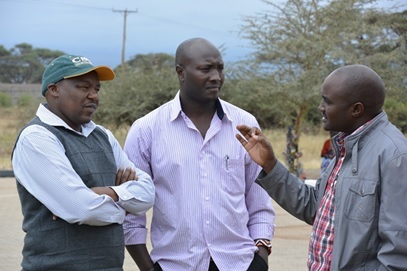 Photo (from left to right): Dickson ole Kaelo, CEO, Kenya Wildlife Conservanies Association; Stephen ole Moiko, managing director of Reto-o-Reto, a pastoral Maasai NGO leading a resilience study of the ecological and social effects of conservancies in the country; and Benson Leyian, general manager of Amboseli Ecosystem Trust (photo by Tomas Pickering). The success of these conservancies depends largely on what these drylands have depended on for millennia: the ability of livestock and wildlife to turn sunlight into food through grass. Kalama and West Gate and other conservancies in the north are experimenting with reseeding their rangeland with perennial grasses and setting aside land for 'bunching' cattle for fattening to get good prices at the market. Elerai Conservancy provides water for elephants. Kenya of course is not the only country to host these bold experiments in meeting the needs of people and wildlife alike. What's different about Kenya is that the conservancies are often created for reasons other than only wildlife conservation: for livestock grazing, security, and markets too. But, in Kenya and around the world, these initiatives, which demand plenty of hard work, often fail. Some fall victim to poor leadership, others to funding shortfalls or corruption. Others inadvertently create more conflict rather than less. Many are started after a severe drought or civil conflict and then fizzle when the crisis has passed. Those conservancies that last do so largely because they have strong local involvement and formed the right partnerships, where people are able to build their knowledge as well as trust and innovate together. The 'social capital' built makes these communities more resilient in the face of challenges, whether it be climatic, political or socioeconomic in nature. Are conservancies the governance 'glue' that links people and wildlife to the land in legal and equitable ways? What about the people who live next to conservancies but are not part of conservancies? Who benefits most from being part of a conservancy: local people, managers, or tourists? What about wildlife outside of conservancies? In other words who wins and who loses when conservancies form? We need to answer these and other questions. But after four decades of conducting research work in the remote corners of Kenya's drylands, we are delighted to pause for a moment today to take in what we have never witnessed before -- the flowering of innovative and community-inspired and -run institutions enabling the peaceful coexistence of pastoral peoples, livestock, and wildlife. Kathleen Galvin, an anthropologist specializing in African pastoralism, is a professor, director and senior research scientist at Colorado State University. Robin Reid, is an author (Savannas of Our Birth), director and professor at Colorado State University.